This Arbor Bow Arm Morris Chair is inspired by the beautiful live oak trees of Southern Florida, and the wonderful surroundings of the Western North Carolina forests. It is my take on the traditional Morris Chair with a twist. 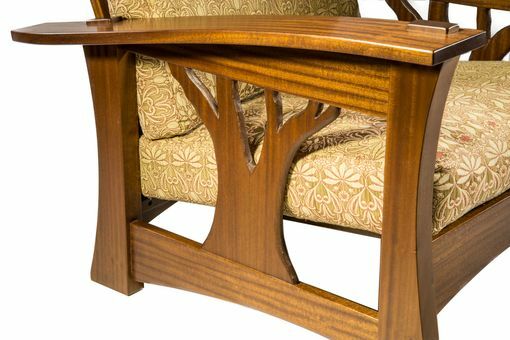 Having built traditional Morris Chairs in the past, this Morris Chair was designed to blend arts and craft with more of an art feel. Constructed of solid mortice and tenon joinery, solid steam bent arms and finished with a hand rubbed oil or lacquer finish. 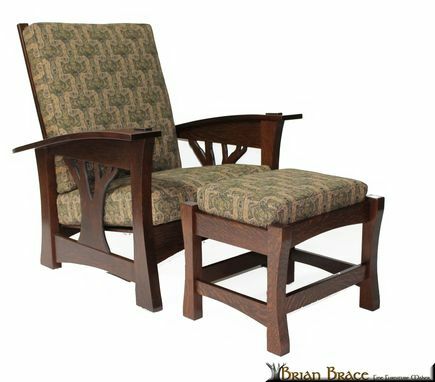 The Arbor Bow Armed Morris Chair follows the traditional Morris Chair design featuring three reclining positions and is as comfortable as it is pleasing to the eye. Down and feather blend cushions are crafted to give pleasure and withstand more than a lifetime. Price varies on your fabric choice, but the chair sells for $3380 plus fabric and the ottoman for $725 plus fabric. Price includes upholstery.